Since she was by far the best singer at Santa Fe, (Daphne in Daphne) I thought it would be nice to know more about Erin Wall. She's from Alberta, Canada, and has competed in the Singer of the World in Cardiff. 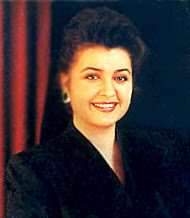 She is coming to Washington National Opera in the fall to sing Donna Anna in Don Giovanni. I predict that Daphne will be a breakout role for her. 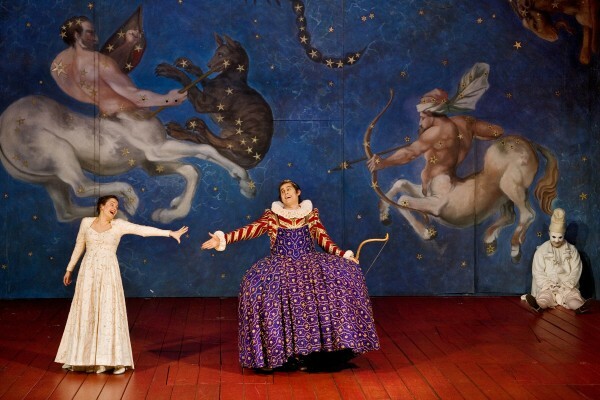 I have had the full Santa Fe Opera experience now. My friends drove up from Albuquerque with a picnic dinner prepared. We parked early and opened up the folding chairs for our tailgate dinner. Down the row of cars were all the other tailgaters. In the car next to ours were a couple of Santa Fe old timers: a theatrical person and an art appraiser, the perfect combination for Santa Fe. Their picnic included two kinds of wine. We loaned them matches to light their dinner candle and explored possibilities of ways I could go and live for a while in Rome. Their idea was quite plausible. I rattled on like a lunatic about John Adams' librettos. We all approved of Nixon in China. We had Caesar salad, roast beef sandwiches and Sekt, the German version of champagne. Then, of course, there was Daphne. They were all out of t-shirts for Tea. Walter Burke Catering will cater your tailgate party, if you wish. Elderhostels come with lectures, including the almost miraculous work of Mireya Cirici from Barcelona on New Mexican art. I always have to brag. She put up a picture of a Santa Fe scene and said it was a painting by a famous painter who visited New Mexico only briefly, not finding it particularly inspiring. I said it was Hopper. It was. I am having a wonderful time harassing Ron Grinage who is lecturing on Tea and Daphne. I behaved for Tea, but his list of recommended recordings of Strauss is definitely lacking. There is no Kiri Te Kanawa, no Elisabeth Schwarzkopf, no Renée Fleming and virtually no Jessye Norman who is represented only by Ariadne auf Naxos. No Lieder. Jessye Norman virtually owns Strauss Lieder. These singers define a style of ecstatic singing of Strauss that is simply not to be missed. I can't just sit and listen. I fall asleep. The New York Times reports that Edo de Waart will join the Santa Fe Opera as chief conductor. He was the conductor of the San Francisco Symphony over 25 years ago, and he's still only 66. Next season an opera by Kaija Saariaho, the composer of L'amour de loin, will be presented. Nice movie. Sometimes the actress, Marion Cotillard, sings and sometimes she lip synchs Piaf. She lip synchs the famous songs in French. It actually works pretty well. That way the early Piaf doesn't sound exactly like the famous singer, and the voice is authentic. No one can actually be Piaf. Her 20 years younger second husband, Théo Sarapo, was strangely missing from the story. In the documentary he was everywhere. The actress is extremely intense, over the top even, which seems very suitable. The movie ends with the famous song "Non, je ne regrette rien" in Piaf's own voice, one of the great song performances ever. What did the mayonnaise say to the avocado dip? How are things in guacamole? What this situation needs is a good joke. Let me know if you know any. Close the door. I'm dressing. Apparently my brain only retains bad jokes. Opera news is starting to read like the tabloids. Luciano Pavarotti is first reported to be much thinner and on death's door. Then his wife says he only wishes he were much thinner, is responding well to cancer treatment and will be back to work soon. 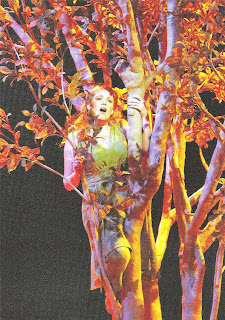 Measha Brueggergosman, the barefoot soprano, is now sporting a nose ring, though no picture is provided. Anna Netrebko has a new secret boy friend. She said this in an interview here. Jerry Hadley has shot himself in the head and is considered gone. This is a very sad business. 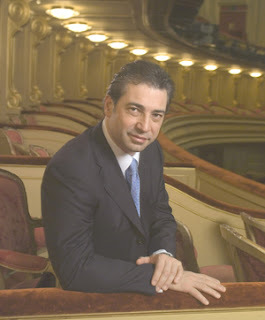 Nicola Luisotti, the guy who is slated to replace Donald Runnicles at the San Francisco Opera, is the same guy who conducted the duets album with Anna and Rolando. Oh, pardon me, that's real news. L'Italo Americano, the Italian-American newspaper, is excited about this. He looks to be pretty cute. 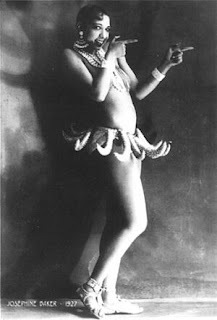 And this picture of the Queen--doesn't she look adorable? I'm pretty sure Katherine Jenkins is the one in the center and Charlotte Church is on the right. And not the reverse as reported elsewhere on the internet. In the back are blue men. The British musical scene is pretty puzzling from our view across the pond. 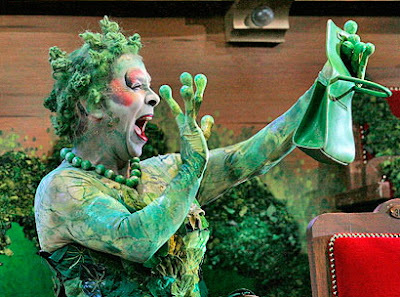 Cecilia Bartoli is going completely mad with her return to bel canto. This month she is recording La Sonnambula with Juan Diego Florez and next April she is singing it in Baden Baden. She is recording her Romantic Revolution and singing it everywhere, except maybe here in the US. She's doing Clari in Zurch. She's doing La Cenerentola in Zurich. I notice Oliver Widmer is singing Dandini in that production. Maybe she will do Norma soon. I don't think I can afford to go to all of these. In my exploration of Kurt Weill I have happened on Ute Lemper and her album “Ute Lemper sings Kurt Weill.” She has all the qualifications for a great Weill singer. First she is proficient at uvular R’s, something we learned here from watching a film of Giesele May. She has also that cool cynicism that Weill exudes. She is irresistible. The difference between the American and the German Weill probably lies in the different nationalities of the singers and not in Weill himself. Ute ist natuerlich deutsch. They were cheap, so I bought a lot of DVDs from House of Opera, including Francesco Cavalli's La Calisto, a work from 1651 Venice. This is the version from Unter den Linden in Berlin, 2002, and is taped from Belgian television. 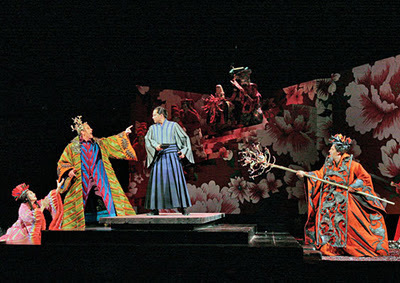 This production is also mentioned in Eyewitness Companions: Opera . These people are up to no good. I have a very deep feeling that this production will tell you more about Venetian opera than anything I could possibly write, or anything you will read in textbooks. Gods and goddesses come and go on bizarre stage machinery. Many claims of chastity are proclaimed, but none are actually maintained. Giove starts out as a baritone, and then makes a fabulous change over to falsetto in his disguise as Diana. There is wonderful coloratura throughout and a complete utter lack of pomposity. I thought about listing off the cast, but they are no one you know. If you buy the DVD, it will list them at the beginning. The picture is good and the sound is adequate. I have reason to believe people are actually reading this. Hmmm. I frequently write things because they are the opposite of what you learn in school. Without knowing the standard wisdom you might think I was giving it. This is a blog. What would be the fun in just repeating what's in books? This has reminded me of my classes at IU with Dr. Hans Tischler, the eminent musicologist. He would stand and lecture from small cards. He would give facts with some accompanying narrative which we would all carefully write down. We were going to be tested on this. The problem was that his facts frequently didn't agree with the facts in standard sources. Most often his dates were different. So is one to believe that the eminent doctor knows this? Or not? When examined, which date should one cite? Or would both be best with a footnote? Tis a puzzlement. Gluck was actually influential in France where operas were always structurally looser and not rigidly tied to happy endings. He was of minimal influence in Vienna and of absolutely no influence in Italy. I was just having fun. You realize that Beverly Sills simply is American opera. She is us more than we are ourselves. And now I must change this to was.